The capture of the Syrian town of Afrin by Turkish-backed forces has helped stir nationalist passions in Turkey, a country that has seen deep political divisions in recent years. Mainstream newspapers carried the news on their front pages. "And the flag is in Afrin" said Hurriyet, the country's biggest circulation newspaper, with a photograph of Turkey's red star-and-crescent flag flying in the town. 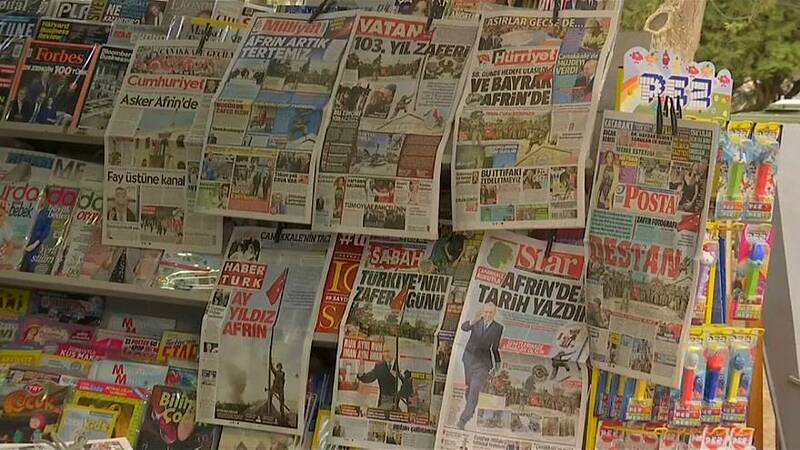 Its rival Sabah, known for being supportive of the government, carried a picture of President Erdogan under the headline "Turkey's victory day". Many Turks consider the Kurdish fighting force known as the YPG that was ousted from Afrin to be an affiliate of the Kurdistan Workers Party (PKK), which has fought a decades-long insurgency within Turkey. "Afrin was occupied by an extension of a terrorist organisation," Ankara resident Burç Aydemir said on Monday. "They were breaching our borders and committing bloody attacks in our country. So for me this operation was the right move, even though it was a little late"
But Turkey's main Kurdish political party, the Peoples' Democracy Party (HDP) has criticised the operation. Berdan Öztürk, an MP for the party, issued a statement on behalf of a number of Kurdish groups appealling for the conflict to end. He said: "We call on the United Nations, European Council, European Parliament, international coalition forces, Islamic countries and the international community as a whole to take steps to immediately avert the tragedy in Afrin and get concrete results including withdrawal of all armed forces who entered Afrin." More than 150,000 people fled the fighting around Afrin in recent days, the Syrian Observatory for Human Rights monitor said at the weekend. The fight for Afrin began eight weeks ago when Turkish troops and Syrian Free Army forces opened a new front in Syria's multi-sided civil war. It highlighted the ever-greater role of foreign powers such as Turkey in the seven-year conflict.